Throughout history most forms of popular entertainment have had their moral detractors. In the 50’s Elvis was only allowed to be shot from the waist up due to his provocative hip movements. Tipper Gore went on a crusade against heavy metal music in the mid 80’s. A 2005 California law banning the sale of certain video games to minors was struck down by the U.S. Supreme Court in June of 2011. For many industries, efforts to ban products for moral reasons have been ineffectual at best, and often when the legal system is actively discriminatory, these efforts are found to be unconstitutional. When it came to comic books however, censoring attacks were extremely successful and resulted in the near collapse of the entire industry. This near fatal blow was orchestrated in large part by one man: Dr. Fredric Wertham. 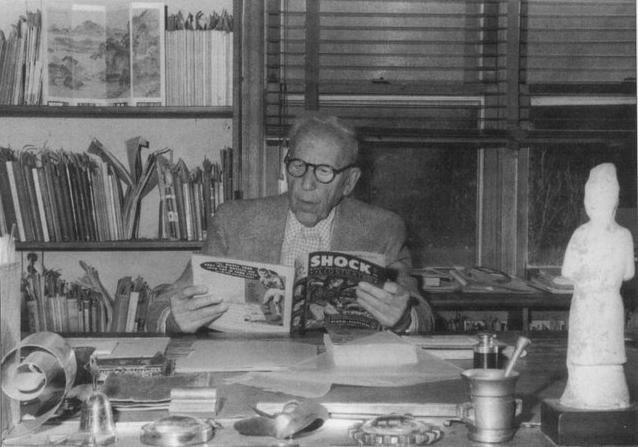 Dr. Fredric Wertham reading a comic book as part of his research. For the sake of fairness, Wertham cannot be wholly blamed for the attacks on the comic industry. There were many other participating parties and several contributing factors that allowed this kind of censorship to take place. However, Wertham’s role is the most important since he provided a scientific expertise around which the comic detractors could rally. In the early 1950’s Wertham was a well-respected psychiatrist who often worked with the poor and juvenile delinquents. It was his work with juvenile delinquents that actually began Wertham’s crusade for comic censorship. As he interviewed the troubled youths, he noticed the pattern that most of the young men were regularly reading comic books. Wertham assumed that a causal relationship existed between comics and deviant behavior, especially when it came to the more graphic horror and crime based comics. Wertham published his findings originally in a Ladies Home Journal article, and then later as book with the titillating title Seduction of the Innocent. Wertham made many unsupported claims within the pages of Seduction of the Innocent including that Batman and Robin were homosexual lovers and that Wonder Woman was a lesbian. He believed that these immoral influences, in addition to the violence in comics, lead to deviant behavior. Soon Middle America was in uproar and the attack on comics was in full swing. It was not uncommon for small towns to hold comic book burnings to rid themselves of the corrupting influence. This came to a head in 1953 with a hearing by the United States Senate Subcommittee on Juvenile Delinquency. Over the course of three days, the Subcommittee heard testimony from Dr. Wertham, as well as EC Comics publisher William Gaines. Much like the subcommittee overseeing the McCarthy hearings, which were being held during the same time period, this subcommittee came in to the hearings with less than open minds. While Wertham was treated politely and respectfully, Gaines was questioned hostilely and treated with disdain. Gaines’ now famous exchange‡ with Chief Counsel Herbert Beaser is a prime example of how the committee members had already made up their minds before hearing all the testimony. In the end the comic industry was forced to choose between imposing censorship on itself, or accepting the inevitable, and likely more restrictive government censorship that was coming their way. 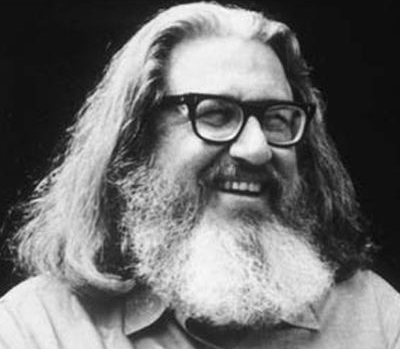 The new rules, called the Comics Code Authority, were loosely based on the film industry’s Hays’ Code and imposed a draconian list of limitations that crippled the comics industry. Among the most punitive measures were those banning all comics from using the words “horror” or “terror” in their titles and severely restricting the content of crime comics. These were both directed squarely at EC Comics, as punishment for Mr. Gaines testimony at the committee hearings. With these restrictions, almost of EC Comics’ books were forbidden, and EC was soon forced to cease publication. Within two years, sixty percent of all comic titles had ceased publication and those companies that remained in business were forced to slash their workforces. The unfortunate reality surrounding these events has only just started to properly come to light. From the outset it was well known that Dr. Wertham’s methods were questionable. A man who should have been well acquainted with the scientific method, he showed considerable disregard for it by failing to establish a control group to compare his findings. If he had, Wertham might have realized that the overwhelming majority of kids at the time read comics. Given that information, it would be impossible for someone to draw the causal relationship that Wertham claimed existed. Dr. Wertham let his attempts to make a name for himself compromise his science. Since Dr. Wertham’s notes became publically available in 2010, the full extent of his questionable methods has come to light. Prof. Carol Tilley of the University of Illinois has discovered several instances where Wertham exaggerated the findings of his interviews in order to tip the results more into his favor. Despite all of this, Dr. Wertham is not without his redeeming qualities. Some of his other research was presented as evidence during Brown vs. Board of Education, where it provided scientific proof that racial segregation was harmful to the mental health of children, aiding in overturning fifty eight years of the “separate but equal” doctrine. While the comics industry may have taken a dramatic hit due to Dr. Wertham’s work, it was not down for the count. The majority of the superheroes we love—including nearly all of Marvel’s characters—were born in an era in which the Comic Code held sway. In spite of the restrictions, these characters flourished and have become deeply ingrained in our popular culture. With the death of the Comics Code Authority in 2011, we can finally say we are rid of Wertham’s shadow, though we should remain vigilant for others who claim to protect common decency for no other reason than to attack those things they disagree with. Comic Book Legal Defense Fund – An excellent resource regarding the history of comic book censorship as well current efforts to fight censorship. Thecomicbooks.com – Provides a full transcript of the Senate Subcommittee hearings.